Rhino Linings® brand name is recognized as the #1 name in the industry. People don't ask for a spray-on liner....They ask for a Rhino® Liner! Pioneered the sprayed-on truck bed liner industry. First company in the industry to be awarded the quality hallmark of ISO-9001:2008 registration. NO FEES! Rhino Linings businesses are independently owned and operated. LEADS! In the last 12 months our website has generated over 225,000 leads for our retail applicators. Exceptional ongoing technical, marketing and customer service support! We Have the Right Product for Your Customer. Whether your customer needs cargo hold or chemical protection, you'll have them covered. We offer various products at different price points so you can remain competitive in the industry. Think outside the truck bed - our products conform to any shape and can be applied to just about any substrate allowing you to spray more than just truck bed liners. The Right Equipment to Match Your Business Goal. The Right Packages to Meet Your Needs - We Beat Any Competitior's Start Up Price, Apples to Apples. You choose your spray in bed liner equipment. You choose the Rhino Linings products you would like to offer. All packages include comprehensive ON-SITE training, including detailed safety procedures. We will beat anyone's start up price - apples to apples! Rhino Linings Corporation is dedicated to providing the best available tools to help you succeed in your lining applications. We offer the highest quality products, along with industry-leading technical, marketing and customer support programs, to help drive customers to your location. Rhino Linings® brand name has been and continues to be the brand that consumers ask for by name! We are looking for successful candidates to join our growing network of Rhino Linings applicators. 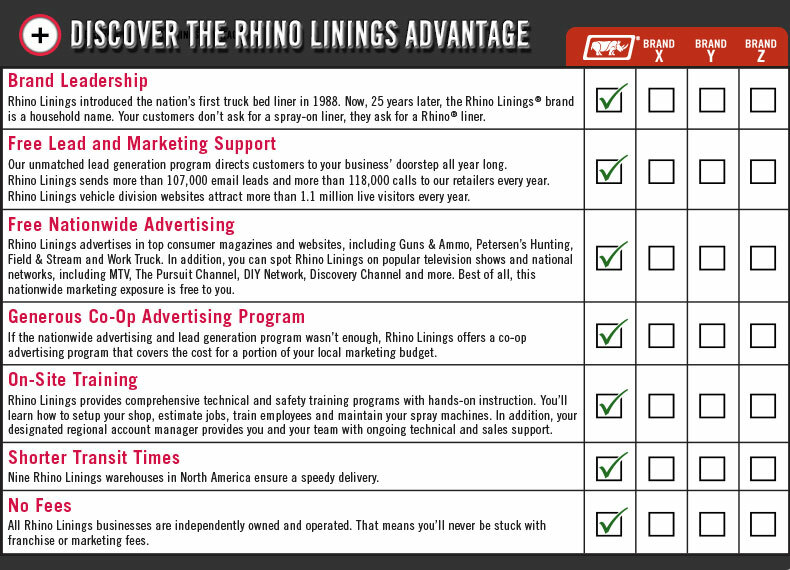 INCREASE YOUR PROFIT POTENTIAL, become an authorized Rhino Linings business TODAY! *This invitation applies only to bed liner companies that are free to terminate their existing supply contracts.